Meaghan Massenat works as an instructor for Branford Hall Career Institute's Professional Fitness Trainer program. With a Master of Science in exercise physiology from Florida Atlantic University, she is also certified by the National Strength and Conditioning Association as a strength-and-conditioning specialist. Massenat has been writing about health and fitness since 2007, with articles appearing in "Flavor Magazine" and various online publications. If you suffer from lack of sleep, yoga may help you snooze better. A study that compared an herbal sleep remedy to yoga found that yoga improved sleep duration and decreased the time needed to fall asleep. The physical demands of yoga, along with its breathing and relaxation techniques, may be the reason for improved quality of zzz’s. And better sleep means you'll feel better during the day. Many seniors suffer from chronic pain in joints and muscles — areas yoga is known to help. After only four weeks of yoga, participants in a Harbor-UCLA Medical Center study reported needing less pain medication. 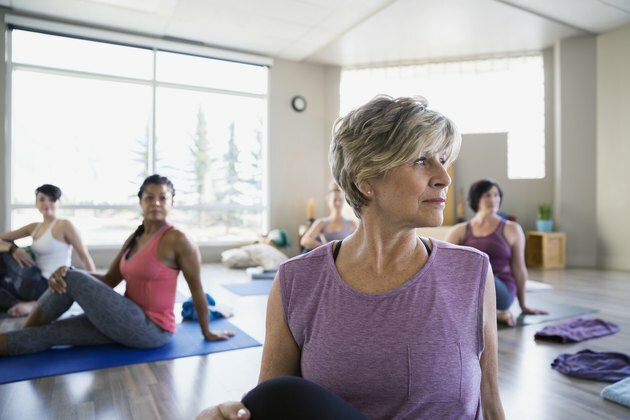 Seniors may find that participating in a physical activity reduces pain and may also see psychological benefits of the social interaction of a yoga class. Read more: What Are the Benefit of Practicing Yoga Daily? Yoga has been reported to reduce high blood pressure, often a serious health concern for seniors. Yoga incorporates calming techniques and physical activity, both of which help to lower blood pressure. Indeed, participants in a group of studies saw blood pressure decrease after a consistent yoga practice. A second study, cited by the Inner IDEA website, reported that yoga's breathing techniques reduced blood pressure better than a soothing activity such as listening to relaxing music. There’s a chance that as you age, you’ve become less active and not as flexible as you once were. Yoga enhances flexibility and joint range of motion; the poses help stretch muscles and lubricate joints. Those suffering from arthritis and other stiff-joint conditions can also benefit from gentle yoga. Poses that involve smooth movements may be more beneficial than static poses. A few days of yoga classes or at-home yoga exercises may be all you need to start feeling more limber and mobile. Acroyoga, anyone?